The 1977 Triple Crown was won by a dark bay colt by Bold Reasoning – My Charmer by Poker. His name, Seattle Slew. He was not “a fashionably bred” colt when he came to the Fasig-Tipton yearling sales in July 1975. The sire Bold Reasoning, was sired by Santa Anita Derby winner Boldnesian, who in turn was by Bold Ruler. Bold Reasoning won the Withers Stakes and the Jersey Derby. He had died in April of 1975 due to complications from a cracked pelvis sustained in a breeding accident at Claiborne Farm. His first crop, yearlings of 1975, contained this colt consigned by Ben Castleman, his breeder. Castleman’s colt was the first foal from his broodmare My Charmer. The dark bay yearling looked backward, awkward even but this was the yearling that the team of Mickey and Karen Taylor along with friends Jim and Sally Hill had chosen to buy. They had set a $15,000 limit but the bidding went past this number. Karen Taylor was determined to get this colt and kept urging her husband to keep bidding. They were successful at the $17,500 mark and the colt now belonged to the Taylors and Hills. The colt was then sent to trainer Billy Turner and his wife Paula to be broken to saddle, and trained for racing. Turner was not very impressed with the colt at first as he was in his words “big and clumsy” and gave him the nickname “Baby Huey” after a cartoon character of similar traits. He was given to one of Turner’s female grooms but the colt, now named Seattle Slew, would prove to be too much to handle. He was strong, wilful and liked to have fun, never becoming dangerous but still preferred things his way. So Turner then assigned John Polston to Seattle Slew as he was a stronger groom who could handle this powerful colt. Polston and Seattle Slew became fast friends and quickly developed a total respect for each other. Polston would later say; “We came to an understanding, we had to. You don’t mess with me and I won’t mess with you. He was one of the strongest horses I ever laid my hands on”. Turner soon discovered that even though the colt was gangly and a little behind from other two year olds, he was a very fast special horse none the less. On an early morning workout sometime around late spring or early summer in 1976, Seattle Slew had galloped a 1.10 and change for six furlongs. Turner was trying to slow him down after the four furlong mark. Turner’s comment later was ”After three strides he would level off and whoosh, he was gone”. The excitement about Seattle Slew was beginning to build around his connections. The Taylors and Hills made regular visits to watch the workouts and the clockers who worked for the Daily Racing Form were beginning to take notice as well. By the time of the Saratoga meet in August the word in the back stretch was out. Billy Turner had a dark colt in his barn with talent. Seattle Slew made his race début on September 20, 1976 at Belmont. He won the maiden event by five lengths as the 5/2 favourite. He would win his next start two weeks later, a three and one-half lengths win in an allowance race. The public a taste of things to come when Slew won the Champagne Stakes by nine and three-quarters lengths in a clocking of 1:34 2/5 for the mile. Seattle Slew earned the Eclipse Award as the Champion two year old for the year. Turner brought Slew to Hialeah for the winter and did as much as he could to relax the horse and keep him calm. He wanted to harness Slew’s speed as much as possible in order to get him to stretch out to the classic distances. Slew would fill out during the lay off and learn his relaxation lessons very well. Seattle Slew demonstrated his unique tip toe dance routine when he came on the track in the post parade. This little ritual he had would be referred to as “The Seattle Slew War Dance”. He renewed his ritual in his first start as a three year old on March 9, 1977 in an allowance race at Hialeah. He won the seven furlong event by nine lengths. Seventeen days later he won the one and one-eighth mile Flamingo Stakes by four lengths. The Wood Memorial was next on Slew’s dance card and he put away a good field by three and a half lengths. In all three races leading up to the Derby he won while setting the pace and relaxing while saving some reserve for the stretch drive. Jean Cruguet had been his rider throughout his career and had developed good chemistry with Seattle Slew, keeping the colt relaxed during their races together. Seattle Slew came to Louisville for the first Saturday in May as an undefeated entrant for the Kentucky Derby. The pressure on Turner from the media was relentless. There were consistently large groups of people around both he and Slew as Turner was trying to keep his charge relaxed, and Slew did enjoy his quiet time immensely. Turner hired night watchmen to ensure Slew was given the required quiet time needed. Polston would also do whatever was required to ensure that Slew was of sound mind leading up to the race. During the pre-race hoopla from the large gathering of people at the paddock, Slew began to wash out and his neck was lathered with sweat by the time he and Cruguet had reached the starting gate. When the gate opened, Slew was near the back of the pack, a position he was not accustomed to, and was surrounded by a wall of horses. His response was to bull his way through in search of the leader. Once he found and reached For The Moment, who was the leader, he imposed his will and hooked up in a speed duel around the first turn and then down the back stretch. The pace was hot but Slew was in command as he led the field at the top of the stretch. He kicked in another gear to widen his lead to five lengths and then turned off the burners to coast home two lengths in front to win the Kentucky Derby. After the race, Seattle Slew was not himself. Polston would say that Slew was so wound up that it was if the horse was still angry as to how the race went. The Preakness was next. Seattle Slew had settled down the following day after the Derby and trained beautifully for the second jewel of the Triple Crown. This time Slew had a better start as he was on the outside of the starter’s gate and then ran with Cormorant for seven furlongs at the head of the field. He put Cormorant away with a strong move through the far turn and powered his way down the stretch to win the Preakness Stakes by one and a half lengths over Iron Constitution. The media spotlight was now squarely on Seattle Slew and his connections. Barn 54 at Belmont Park became the go to place for every turf writer at the track. Could there be another Triple Crown winner so soon after Secretariat? Furthermore, in the history of the Triple Crown no horse had ever won the series undefeated. Here was a horse that could make history and became the first to do so. Turner had been aiming Slew for the Belmont all along and prescribed two one mile gallops for his morning workouts to take the edge off the colt and wanted no faster than 1.37 for each mile. Slew responded with a pair of 1.37 2/5 works and Turner was satisfied. Rain had been steadily coming down for days prior to the June 11 Belmont Stakes, making the track into a heavy muddy surface. Seattle Slew had never run a race on a track in this condition before. As with all of his previous starts Slew was made the favourite in the betting, going off at 2/5 odds. Seattle Slew had started to become more accustomed to the increased attention he was receiving, even beginning to relish it. He would “pose” for pictures but when the tack was secured and Cruguet was aboard he was all business and had his game face on. The race begins right in front of the massive grandstand at Belmont and this was another new feeling for Slew as he had never started a race so close to the big throng of people before. No need to worry though as Seattle Slew broke from the gate cleanly and did his thing, running at the front and dictating the pace. He led throughout. Only briefly was he challenged along the back stretch, but then Slew pulled away through the far turn to a five length lead and was never threatened in the long Belmont home stretch. Seattle Slew became the tenth winner of the American Triple Crown and the only undefeated one. This is a record that can be equalled, but never beaten. Turner wanted to give Seattle Slew a long rest but the Taylors and Hills had other ideas. They were from the west and wanted to run Slew in the Swaps Stakes at Hollywood Park on July 3. A riff was to develop between trainer and owners as Turner was vehemently opposed to the idea. He was also not very happy with the owners allowing Slew to be used in an advertising campaign for the Xerox Company promoting a new Equine X-ray machine. Slew had to go to Dr. William Reed’s clinic three times, tranquillized each time, for the photo shoots. Furthermore, Slew had to be tranquillized for the long journey to California. Seattle Slew would taste defeat for the first time in the race. J O Tobin defeated Seattle slew by sixteen lengths. Slew was dull before and during the race and was clearly not himself. The owner/trainer relationship was to deteriorate further when the Taylors and the Hills brought the horse to Longacres Racetrack to parade Slew on their home town track. During this time Turner was battling his own personal demons as well. Everyone concerned genuinely loved Slew but something had to give. Billy Turner was fired as Seattle Slew’s trainer during the winter and the champion was put under the care of Doug Peterson. The Taylors and Hills were raked over the coals in the press after the announcement but they kept a lower profile and to their credit, did not publicly discuss the incident for many years. Peterson was now the trainer of a Triple Crown winning Eclipse Horse of the Year star and would have enormous pressure to expand on this record. He was to find out first hand just how extraordinary a thoroughbred Seattle Slew is. Seattle Slew wintered again at Hialeah but this would not be a relaxing winter when Slew became ill in January. He stopped eating, one of his favourite pastimes, and broke out into hour long sweats sometimes falling when he tried to stand. Jim Hill is a veterinarian and diagnosed a severe viral infection and feared the worse for their champion. Slew made a long slow recovery, but recover he did and was ready to take on challengers in an allowance race at Aqueduct on May 14, 1978. The track was sloppy for the seven furlong race but Slew slewed them winning by eight and a half lengths. His next start came two months later at Saratoga. In another seven furlong allowance race on a sloppy track the champion won by six lengths. The Marlboro Cup was coming up soon and a date with the newest star of the turf Affirmed was anticipated. Peterson wanted a tougher race in Slew before the big showdown and chose the grade three Patterson Handicap as his prep race. The race is nine furlongs run under the lights at the Meadowlands. Dr. Patches upset Seattle Slew beating him by a neck in the race. In a bold move Peterson fired Jean Cruguet after Cruguet had expressed doubt if Slew was fit enough to have run in the event. The Marlboro Cup was ten days later and Peterson employed Angel Cordero to ride Seattle Slew. The race was to become the first meeting between two Triple Crown winners in history with Affirmed the newest member of this very exclusive club entered. Affirmed was bet down as the favourite, the first and only race in which Seattle Slew did not start as the favourite. Seattle Slew broke from the gate in his usual manner and was never headed throughout as he beat Affirmed by three lengths. Seattle Slew then won the one and a quarter mile Woodward Stakes by four lengths over Exceller but that rival would turn the tables and beat Slew in the 1 ½ mile Jockey Club Gold Cup by a nose. Slew had run his heart out in this race after holding the lead fending off Affirmed in their second meeting. These two cut blazing fractions of 22.3, 45.1, and 109.2 and then were passed by Exceller in the stretch. Seattle Slew gamely fought back and almost got to the winner at the wire. Seattle Slew finished his racing career by winning the Stuyvesant Handicap carrying 134 lbs. His final racing totals was seventeen starts, fourteen wins, two seconds and one unplaced. Slew retired from racing and to begin his stud career at Spendthrift Farm in Lexington Kentucky. He later moved to Three Chimneys Farm in Midway Kentucky in 1985. Despite his exemplary track record, his pedigree would come into question to some breeders who were not convinced of his stallion potential. Seattle Slew was inbred 4 x 4 to Nasrullah but his own sire and broodmare sire were not of popular patronage. Slew would go on to become the prime conduit to the Nasrullah/Bold Ruler male line to the present day. He became a leading sire, siring one-hundred and twelve stakes winners lifetime and also become a sire of sires of which A.P. Indy would be his flag bearer to continue the proud line. A.P. Indy was the Eclipse Horse Of The Year in 1992 when he won the Breeder’s Cup Classic, Belmont Stakes and Santa Anita Derby. He was bred at Lane’s End Farm in Kentucky and would return there to stand at stud for his entire career. He is the sire of Rags To Riches, Aptitude, Tempura, Marchfield, Steven Got Even, Serenading, Dreaming Of Julia, Mineshaft (sire of Discreetly Mine), Bernardini (sire of Stay Thirsty), Malibu Moon (sire of Orb), and Pulpit who sired Tapit (leading sire in 2014) and Lucky Pulpit (sire of California Chrome). I am not going to go into great detail of his career on this article as I have highlighted A.P. Indy in a separate article on this web-site to examine in greater detail his enormous accomplishments as a sire. Slew O’ Gold became the first champion son of Seattle Slew. His championship years were as a three and four year old. At three the late developing Slew O’ Gold won the Wood Memorial, the Woodward Stakes and the Jockey Club Gold Cup. At four he was to capture the Woodward and Jockey Club Gold Cup again as well as the Marlboro Cup and the Whitney Handicap. His second place finish in the inaugural Breeder’s Cup at Hollywood Park was one of the most exciting stretch runs ever witnessed when he was squeezed by Gate Dancer into the eventual winner Wild Again. At stud Slew O’ Gold would stand at Three Chimneys Farm in Kentucky where he had good success getting grade one winners Awe Inspiring, Gorgeous, Dramatic Gold, Golden Opinion, Tactile, and Thirty Six Red. Slew O’ Gold was pensioned from stud duty in 2002 and died of old age five years later. He is buried at Three Chimneys Farm. Seattle Slew sired a steady stream of top stakes winners and champion horses. Swale was one of his best but was also one of his most tragic. Swale won the Breeder’s Futurity, the Belmont Futurity and the Young America Stakes at two. As a three year old he capture the Hutchison Stakes and the Florida Derby leading up to the Kentucky Derby, which he duly won in the colours of Claiborne Farm. A perplexing seventh place finish in the Preakness was followed by a rousing victory in the Belmont Stakes. Tragically Swale suddenly died eight days later of what was a suspected heart attack. The necropsy disclosed that although the cause was inconclusive, he did suffer from a heart abnormality. Swale collapsed and died quickly, nothing could have been done to save him. He was named Champion three year old posthumously. Another champion son of Seattle Slew was Capote. This colt won the Breeder’s Cup Juvenile and was named Champion two year old. He did not train on as a three year old, losing all six starts. As a sire he has gotten Boston Harbor, who emulated Capote by winning the Breeder’s Cup Juvenile and two year old Champion honours. Other top class grade one winning sons of Seattle Slew include Seattle Song who won the Prix De La Salamandre in France and then the Washington D. C. International in the US. Slewpy, winner of the Meadowlands Cup and the Young America Stakes. Fast Play captured the Remsen Stakes. Slew City Slew was victorious in the Oaklawn and the Gulfstream Park Handicaps. Tsunami Slew took the Carleton F. Burke Handicap. Seattle Slew’s daughters were also very good on the track and some of which produced excellent foals as broodmares as well. Landaluce was the Champion two year old in 1982 winning all five of her races which included the Oak Leaf Stakes. Tragically, Landaluce died shortly after her biggest track triumph from Colitis X.
Surfside was a royally bred miss who lived up to her pedigree when she won the Santa Anita Oaks. Seattle Meteor was another well bred daughter of Seattle Slew and became a grade one winner when she captured the Spinaway Stakes in 1988. Still more high class daughters of Seattle Slew include Glowing Honor a two time winner of the Diana Handicap. Savannah Slew won the La Brea Strakes beating Lady’s Secret. Seaside Attraction would win the Kentucky Oaks and then become a very good broodmare herself as she was the dam of three time grade one winner Golden Attraction and Florida Derby winner Cape Town. 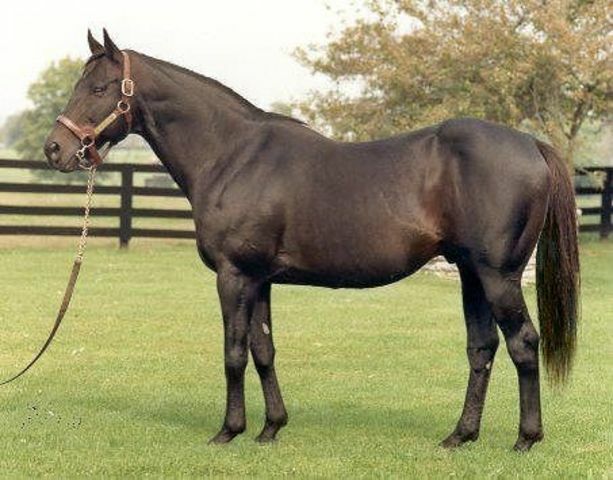 Seattle Slew became a leading broodmare sire as well, spreading his considerable influence through his exceptional daughters to future champions. Charming Lassie would produce Lemon Drop Kid. Slewvera was the dam of Boboman. Claxton’s Slew foaled Escena. Solar Slew was the dam of the mighty Cigar by Palace Music. Cigar was a two time Eclipse Horse of the Year and was the author of a sixteen race winning streak during which he won nine grade one races. Cigar eventually won twelve grade one races among his nineteen track victories from thirty-three starts. Unfortunately, Cigar would prove to be sterile and therefore did not breed. In February 2000, Seattle Slew was diagnosed with a compression of his spinal cord due to arthritis. He had shown a distinct lack of coordination the month prior and was treated for a neurological condition. The compression of his spinal cord was operated on, a procedure that lasted seventy-five minutes and he came out of the anaesthesia feeling good as new. The lack of coordination returned the following year and surgery was again performed to fuse the joint between two vertebrae. He was to receive complete rest to recover. However, when he would sense the mares coming to the farm to be bred, Slew’s strong libido kicked in causing him to become anxious and excited. The Taylors, who had taken control of his stallion career, had him transferred to Hill N Dale farm to get the rest he needed. Seattle Slew is one of the most important thoroughbreds in the last quarter of the twentieth century. His influence is on going into the twenty-first century through his exceptional progeny, as they are breeding top class horses and champions themselves. His sire line is vibrant and very much “in fashion” which he has created himself. Slew died peacefully on May 7. 2002, twenty-five years to the day of his Derby win. He is buried at Hill N Dale farm just outside Lexington. A large statue of Seattle Slew was erected by Three Chimneys Farm near the stud barn he had occupied. Seattle Slew was a champion in every sense of the word. Does anyone understand why, Jean Cruguet has not been inducted into the Racing Hall of Fame at Saratoga ? For the life of me, I can not understand why year after year, he is not inducted. For Pete’s Sake……he won the Triple Crown aboard Seattle Slew !! A very valid point Pattie about Jean Cruguet. He was a very capable and prominent jockey in his day. He has the resume to be inducted. Thank-you on a wonderful article on one of my most favorite horses of all time. He was all heart, and he past that on through time, There is one other son, that I didn’t see mentioned Seattle Song. Seattle Song was a good sire, that sired Cee’s Song, who is the dam of another of my favorites, Tiznow. Tiznow has a lot of characteristics of Seattle Slew = Heart, and that extra will to win, intelligence, and that demand for respect. They both respond/responded to people who treat/treated them with respect, and talked to them. As one of the people thar handled Seattle Slew said, “He is a very kind and generous horse, if you ask him to do something, but if you ordered him to do something, you were in for a fight, and you would lose.” I see the same ways in Tiznow. Thank you Roberta for your kind comment. Actually I do mention Seattle Song but I did not mention that he is the broodmare sire of the wonderful Tiznow, also a personal favourite of mine as well. I plan to do an article on Tiznow for a future post since he has been a very good and productive sire recently. Stay tuned !! I and a lot of other people will be looking forward to the article on Tiznow. He is a character, and seems to pass it on to his foals; he is a favorite of a lot of people. Thank-you for reintroducing Seattle Slew to some of the younger crowd, that maybe didn’t realize what a great horse he was. I’m sure you know this, but he died on the anniversary of him winning the Kentucky Derby. He said goodbye to the Taylors, and the dog that were in the stall with him, and quietly passed away in his sleep. Maybe he was dreaming of running in the lead, running for the finish line in the Kentucky Derby, with everyone being left behind in his dust. I remember in the Belmont, as he was in the lead, about 3 times, they kept announcing, “and his finding more; he’s pulling away again”. He could really carry that speed!! He was special right to the end; he even passed away with CLASS!!! !